It's hard to argue that the rise in popularity of the internet has a direct correlation to an affinity for cats. Love them or hate them, the felines have made a name for themselves across the web in videos, GIFs and countless other incarnations. One of the most famous cats is known as Grumpy Cat and now "The World's Grumpiest Cat" has entered into a deal with Dynamite Entertainment (via Grumpy Cat Limited) to develop print and digital comic books/graphic novels. 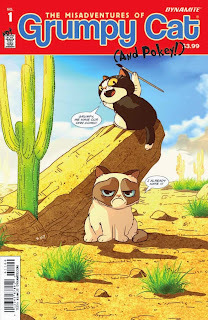 Grumpy Cat will debut the first of her all-new misadventures in a three-issue miniseries, released in Fall 2015 and collected into a hardcover graphic novel in time for the holiday season. Dynamite also plans to launch a website this summer where new Grumpy Cat comic strips will go up online every week. "With her ever-present pout and sassy disposition, Grumpy Cat has won the hearts of people everywhere. I can tell you, we're thrilled, just absolutely thrilled, to bring this adorable curmudgeon's misadventures to the comic world!" says Keith Davidsen, Marketing Manager of Dynamite Entertainment. "One of the most important responsibilities for today's comic publishers is creating content that will attract fresh new audiences to experience the wonders of the medium, and Grumpy Cat is the perfect combination of unbearable cuteness, instant fan appeal, and established multimedia presence to make just such a thing happen. If you love the memes, the videos, and that irresistable scowl, then get ready for the wildly fun antics of Grumpy Cat and Pokey in Dynamite's all-new, all-sensational Grumpy Cat comics!" Grumpy Cat's global following includes 7.6 million Facebook fans and over 31 million YouTube views. Since her photos first went viral in 2012, Grumpy Cat has gone from Internet star to real-life celebrity. She has two New York Time Best Selling Books, her own Lifetime movie Grumpy Cat's Worst Christmas Ever (voiced by actress Aubrey Plaza), has made numerous appearances including the MTV Movie Awards, American Idol, The Bachelorette, The Today Show, SXSW, Good Morning America and even hosted WWE Monday Night Raw. Grumpy Cat is Friskies official "Spokescat," has filmed videos with Disney and Sesame Street and appears in commercials for McDonald's and Honey Nut Cheerios. Licensed Grumpy Cat merchandise is currently available at retailers worldwide. May 27, 2015, Mt. Laurel, NJ: Dynamite is proud to announce a collaborative licensing partnership with Grumpy Cat Limited to develop print and digital comic books and graphic novels featuring "The World's Grumpiest Cat" and her brother, Pokey. Grumpy Cat will debut the first of her all-new misadventures in a three-issue miniseries, released in Fall 2015, and collected into a hardcover graphic novel in time for the holiday season. Dynamite also plans to launch a website this summer where new Grumpy Cat comic strips will go up online every week. Grumpy Cat's global following includes 7.6 million Facebook fans and over 31 million YouTube views. Since her photos first went viral in 2012, Grumpy Cat has gone from Internet star to real-life celebrity. She has two New York Time Best Selling Books, her own Lifetime movie Grumpy Cat's Worst Christmas Ever (voiced by actress Aubrey Plaza), has made numerous appearances including the MTV Movie Awards, American Idol, The Bachelorette, The Today Show, SXSW, Good Morning America, and even hosted WWE Monday Night Raw. Grumpy Cat is Friskies official "Spokescat", has filmed videos with Disney and Sesame Street, and appears in commercials for McDonald's and Honey Nut Cheerios. Licensed Grumpy Cat merchandise is currently available at retailers worldwide. 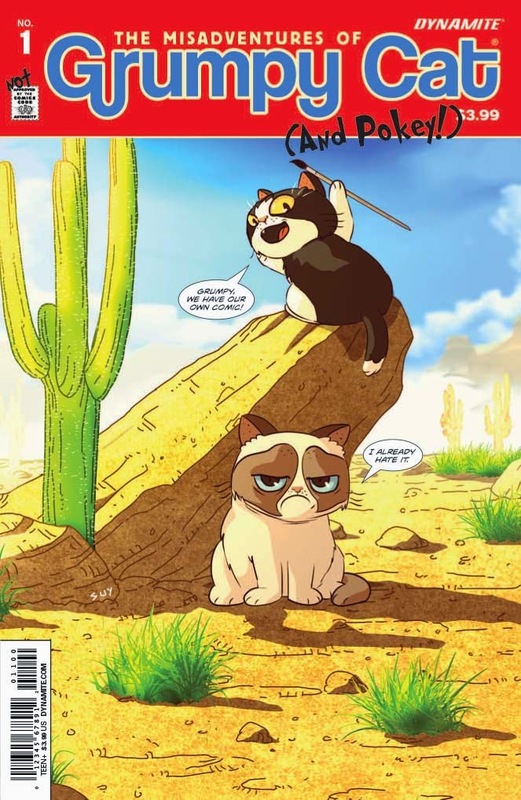 Dynamite Entertainment's Grumpy Cat comic books and graphic novels will be available to consumers through the comic book specialty market, and its graphic novels will be available at major bookstore chains, online booksellers, and independent bookstores courtesy of Diamond Book Distributors. Grumpy Cat comics will also be available for purchase through digital platforms courtesy of Comixology, Dynamite Digital, iVerse, and Dark Horse Digital. Fans and retailers are encouraged to follow Dynamite Entertainment and Grumpy Cat's official social media channel for the latest updates regarding creative teams and release dates. To find a comic shop near you, call 1-888-comicbook or visit http://comicshoplocator.com/.